Try D166 on a polishing pad and see if that gets the results you are looking for. The finishing pad may not be enough to get the job done. I missed that part. In that case then he may need to step up to a cutting pad whether it be a foam or microfiber pad. The paint dictates whether it is hard, medium or soft. Not to mention that an AIO lacks the cut of a dedicated polish or compound. Nick should be posting the TNOG schedule in the next couple of weeks. Possibly you could make the first one and try the products there. I have noticed that sometimes detailers slow down their arm speed and get better results with D166. Mike Stoops has helped folks find the right process with D166 on differing paints, and might be able to respond. So what is the difference between the 3 in 1 Wax and Cleaner Wax? Do It Right or Don't Do It At All. The 3 in 1 is a stronger cleaner, so better dirt and defect removal. And then the wax it leaves behind is longer lasting than the older Cleaner/Wax. Yes, I tried both pads at different speeds and different amount of passes. If I can make it out to a TNOG, I will definately go. All depends with my work schedule. Have you considered stepping up to a polish and see if that takes care of the defects. I didn’t, only because it seems like I was adding “smaller” swirls? If that makes any sense. I have some ultimate polish I can give a try with or even some 205. Just figured I’d give D166 a go and see what happens. I wasn’t sure if my technique was correct or not. I’ll try another polish though, and see what the outcome is. Sounds like you may be seeing micro marring. Usually happens with softer paints. Thanks Nick for your post. 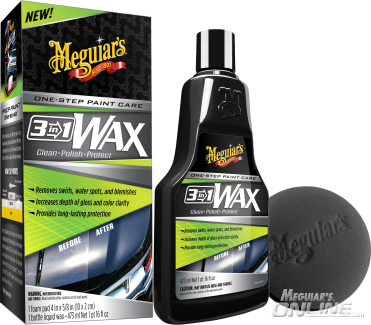 Would you consider making a thread for Meguiar's discontinued products? It would help us out a lot in building up our arsenal of Meguiar's products. Looking to restore your vehicle's paint to its former glory but don't have all day to compound, polish, and wax? Meguiar's decades of experience in paint care and surface chemistry has lead us to a breakthrough solution. Our 3-in-1 Wax will improve your paint's finish, enhance shine, and leave behind a durable coat of wax. All in one quick and easy formula! Is the Meguiarâ€™s Owner, Barry Meguiar, a Member of This Board?